Whether you are looking for something that can play your phone videos, pictures, games and so on to a big TV screen or Projector, Then you can enjoy them with families or friends together? Yes Wifi display dongle, it can make your idea come true in a very simple connection. What is the Wifi display dongle? 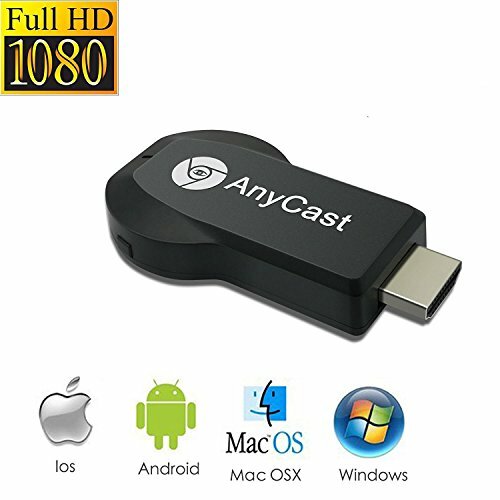 With Anycast Wireless display dongle, you can enjoy playing your contents (photos, videos, games, browsers, PPT and other files) from Android smartphone / iPhone / tablet PC to other HDMI display device (TV /projector/ monitor). Wifi display dongle is a special device to protect your mobile phone/MID/Notebook to another big screen through WiFi connection, under the popular standards like DLNA, Miracast, and Airplay. You can enhance your TV/Projector/Monitor which have HDMI input socket, with more features like streaming video, web surfing, photo viewer, live camera, internet video and more, to enjoy excellent multi-display sharing. 1. The wireless display dongle Supports 3 modes: Miracast, DLNA, Airplay. 2. The Mini Display Receiver Dongle has Lightweight and portable pocket size to carry, you can carry it in a pocket wherever you are. 3.Easy Setup: Only 3 steps to enjoy media files on the large screen: Plug>MiraCast>Mirroring. No additional app or driver on your smartphone or tablet is required. ★If your OS is the latest or relatively new, please enter the dongle router management menu to update unless it will not work. 【Compatible With Multi-Device】The Wifi display dongle is compatible with smartphones and tablets such as iPhone, Samsung, Sony, iPad with Android 4.2 and iOS 7 above, Windows8+/Mac10.8 laptop, eg iPhone8,8 Plus, 7/7 Plus, 6/6 Plus, 6s/6s Plus, 5/5C/5s , 4S/4, SE, iPad 2/3/4/iPad mini/Air/Pro, Samsung/Google/Nokia/HTC/LG, etc. With this wifi display receiver, you can easily share high-resolution media files with friends and family. 【High Level Security】: The Wifi HDMI Dongle meets stringent CE & ROSH certification requirements for product safety, which drastically reduces the risk of fire, overheating and disconnection compared to other HDMI dongle. Note: Before you use, pls switch the TV signal source to HDMI first. And pull out the USB Plug when not using. 【Easy Operation】Plug&Play, Only 3 steps to enjoy media files on the large screen. Plug>Connecting>Mirroring by using Miracast, DLAN and Airplay No additional app or driver on your smartphone or tablet is required. 【Satisfaction Guarantee】All Our Wifi display receiver provides a 30 days money back guarantee with a one-year warranty. We also have an excellent customer service team that can help you make the perfect shopping experience within 24 hours(contact us for more information). If you have any questions about this product by Acsurpo, contact us by completing and submitting the form below. If you are looking for a specif part number, please include it with your message.